The EHS Main Office is located in the Campus Safety Services Building (CSSB), at 1239 Kipke Drive; East of Crisler Arena and the U-M Football Stadium. We face Stadium Boulevard and the U-M Golf Course. 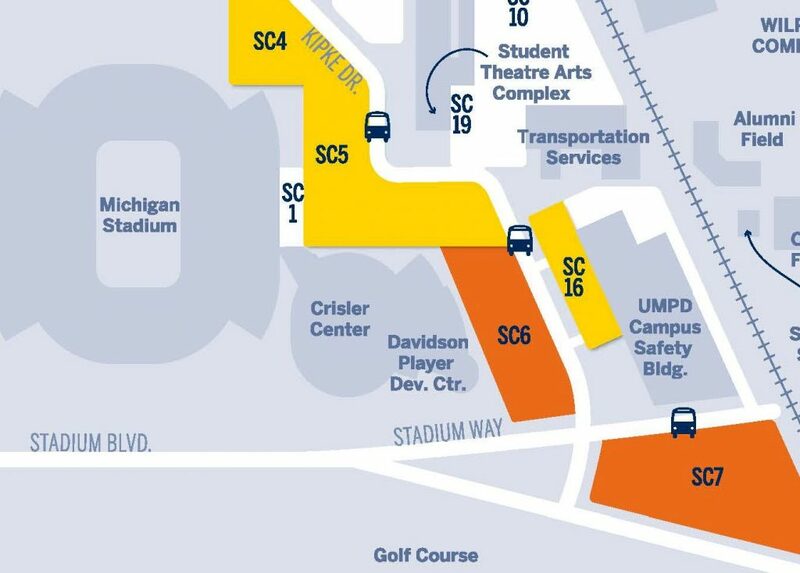 Take the Southbound Commuter bus to the last stop, just past Crisler Arena in Commuter parking lot, SC7. As you exit the bus you will face the parking lot (South), move left toward the front of the bus and the railroad tracks (East). Continue walking East until you reach our front entrance, to your left. EHS is located in the white Campus Safety Services Building (CSSB), with a blue canvas awning over the entrance. Travel South on State Street, turn right onto Hoover Avenue. Continue West on Hoover Avenue, cross the railroad tracks, turn left onto Greene Street. As you approach the U-M Football stadium turn left onto Kipke Drive. 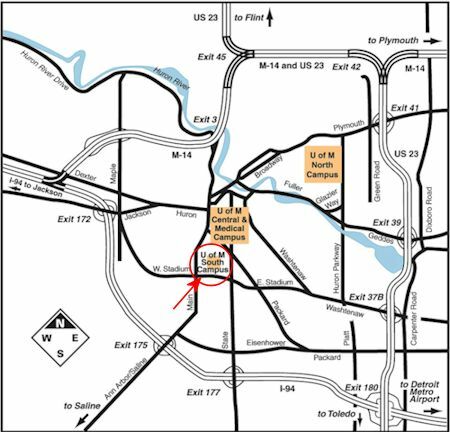 Continue on Kipke Drive past the U-M Police Department until you reach the Commuter parking lot, SC7 (just before Kipke Drive exits onto Stadium Boulevard). EHS is located in the white Campus Safety Services Building (CSSB), with a blue canvas awning over the entrance. Travel West on Fuller Avenue. Fuller Avenue turns into Glen Avenue as it curves South around the Medical School. Continue South on Glen Avenue, turn left onto East Huron Street. East Huron Street curves South and becomes Washtenaw Avenue. Continue on Washtenaw Avenue, turn right onto Forest Avenue. Continue on Forest Avenue, turn right onto Hill Street. Continue on Hill Street, turn left onto Greene Street. Take the 1st Right into the Commuter Parking Lot. EHS entrance is at the northeast end of the parking lot. The overhang above the door is blue.